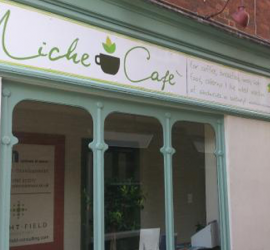 Niche Cafe is a family-friendly cafe at the very heart of the Sudbury community situated next to the world renowned Gainsborough Gallery. We serve up a massive selection of daily freshly prepared food with plenty of vegetarian options. Choose from Sandwiches, Baguettes, Bagels, Paninis and Toasties all with a side of tortillas and salad. Each week we prepare an array of Homemade Quiches, Soups, Biscuits, Cakes, Sweet Treats, Scones and a variety of other homemade specials! Niche also offers a selection of vegetarian and gluten-free options including gluten-free baguettes and sweet treats. All our food is prepared fresh each day from the finest (and locally sourced) ingredients for tongue enticing flavour and eye enticing gorgeousness. Niche offers free Wi-Fi and has air conditioning in the main seating area for those hot summer months & heating for those winter months. We also have a Lounge area with sofas and armchairs available for functions and a children’s play area to be put in come Winter. Did you know Niche also offers catering for functions including weddings, funerals, parties and other special occasions. Inquire by phone or in branch for details.